[Theory] Greatest Hits! Mamoru: Protector of the Sun? Sailor Mercury is protected and protects planet Mercury. Sailor Saturn is protected and protects planet Saturn. Sailor Mermaid is protected and protects planet Mermaid. Sailor Ceres is protected and protects the asteroid Ceres. However, despite every plane of power having a set senshi, the sun is never actually mentioned as having such a protector. Could it be that because the body of power is a star itself, it does not need to retain a senshi? The sun can't actually sustain life as it is a giant ball of gas and fire, so what people would it protect? My theory? It protects the same thing as the moon; the Earth. And Mamoru is it's guardian. Here Nehellenia refers to Mamoru not as protected by his planet, but by the 'sun'. While in some ways this could throw a person off, as it is a detail that has never been brought up nor said again, it does make sense. Helios stated that the Earth is protected by two halves. The Silver Millennium from the outside (Usagi's kingdom) and Elysian from within (Mamoru's kingdom). In which case, if Mamoru is the sun's protector, then both Mamoru and Usagi work as being both the guardian's of Earth. The Earth itself needs both the sun and the moon to live, as the moon works the waves and the sun proves light and life. Helios:as the personification of the sun in Greek myth. In the Sailor Moon manga/anime, he is the guardian priest of the Earth, Elysian, and Mamoru. Helios works as an adviser for Endymion as Luna has for Usagi. As such, he holds a name that links directly back to what he represents. Helios: Relates to the Sun rather then the Earth. Of course, this could be me over analyzing in one panel, buuutt I wanted to see if anyone else saw it. This could also mean that if there is a Sailor Sun, she'll come from Mamoru's bloodline. Wait, so he represents both earth and the sun? The theory is that Mamoru is basically "Sailor Sun" and as such protects the Earth just as Usagi does since the Earth needs both the moon and sun to exist. That makes a lot of sense, actually. It just never clicked when I made the previous post. So then a Sailor Earth WOULD be up for grabs! I've always thought that the Senshi exist because of and to protect the life on their various heavenly bodies. Since there's no life on the sun, it wouldn't really need a protector. BUT, the theory presented here is pretty valid. All of this makes me think of Chibiusa. Then does that mean that Earth has no Sailor Senshi Guardian to protect it? That the protector is not yet born. The Sun and the Moon give life to the Earth. Mamoru and Usagi give life to Chibiusa. We see a picture of Princess Lady Serenity all grown up and Helios calling her a maiden, expecting her to be the savior and the one to awaken the Golden Crystal, which is linked more with the Earth than the Silver Crystal. Perhaps now that all her training is done as seen in the end of Stars, she can start with her new senshi and separate her identity as a senshi further from her mother. Sailor Chibi Moon is usually told in headcannon as a training title under her mother. I know a lot of people believe Senshi names are just titles and I do agree with the name Chibi Moon being just a title... but as a fully trained senshi, wouldn't she be called something other than Chibi and even Moon? She was born of the Moon and if we follow this theory, the Sun. But there is something magical about believing the Sun and the Moon Guardians gave birth to true Guardian of Earth. But what about her Senshi Crystal being called the Pink Moon Crystal? Looks like another temporary title to me. Now, in Sailor Moon: Another Story, Mamoru's Golden Crystal is refereed to as the Barauishou... or was that his crystal? Either way, in my opinion, if Chibi's real senshi purpose is to be Sailor Earth, than I imagine the perfect name for her pink rose shaped crystal being Barauishou. Rose Crystal. Oh the ideas are spinning in my head so fast. I love this theory! 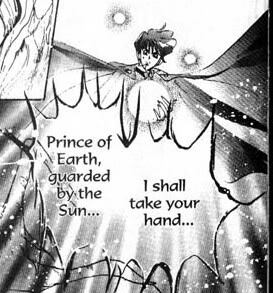 I think when the manga states that Prince Endymion is protected by the sun, it's in the sense that the Earth is actually protected by the sun. Only planets can support life, and Earth is the only planet (as far as current science knows, any ways :p) in our solar system that can support life. It's theorized that this is the case because the Earth sits in the habitable zone of our star, the sun, where we have the right balance of sunlight that fuels life processes. Many religions also worship the sun as a giver of life, and it's not hard to see why humans might view the sun as our protector, providing us with light and warmth. This notion is presented in the manga as Mamoru being protected by a priest named after the Greek sun god, Helios. Mamoru is representative of the earth. He is an "equivalent" of Sailor Earth. He is the prince of earth. He has a strong, basically spiritual link to the earth. I've always just accepted him as the earth guardian. Plus all the senshi are guarding the earth so earth almost doesn't need a Senshi in a sense. I can see Mamoru guarded by the sun because the sun gives the earth life and such but I don't believe there is a Sailor Sun. The sun is a star. Senshi are, as far as I understand, guardians of planets (or satellites in Sailor Moon's case). Not stars. I've argued elsewhere that Helios is actually Mamoru's priestly avatar, and thus in many ways the equivalent of Queen Serenity to Princess Serenity. The problem with that theory, however, is why it took so long for that storyline to be developed. It's the first time in a long time (not to mention the last time) that we see the Shittenou (I've argued elsewhere that they live on as ChibiUsa's Amazon Quartet.). Wouldn't they have had a relationship with Helios as the Four Kings of the Earth? Shouldn't they play something of a significant role in relation to the now restored Kingdom of Elysium/Elysian? Why don't we see Elysian figuring into the Kingdom of Crystal Tokyo in the future? Also, I have to admit that ChibiUsa's crush on her father lasting until the Dreams Arc somewhat disturbs me. She doesn't quite get over it, but rather she transfers those feelings onto Helios, her father's priestly form. You brought up all the great points that helped me come to the same opinion Sailor Uranus. If Mamoru were a Sailor Sol type character if he were born a girl in this lifetime, I wonder if she'd have a signature hairstyle too? The idea that Chibiusa is a replica of her mom in style, looks, civilian and princess name just soured me on believing she'd be a copy of her mother in senshi form forever too. I can see how it could work and how it's still pretty awesome but I just want a little uniqueness to her character and she really fits the role Sailor Earth more than a new Sailor Moon to me. I've also never believed the Senshi pass on their titles when we learned they are just reborn into a new body and keep the ability to transform into their other selves despite new bodies. I've also heard theories about how the Senshi are not always reborn as women and that they can be born any gender but only females can transform into Sailor Senshi. I imagine, if Mamoru was Sailor Sun, when Metallia awoke and he started having nightly visions and even tranforming unaware because of it, that it was his unconscious power not able to fully come to the surface because he's male and he ended up creating Tuxedo Kamen to make up for it. Similar to a senshi, but not quite. He's powerful but not as powerful as the Senshi too and maybe that's one reason why. He can never fully access his powers because that's not the life he is currently leading. Like in the anime for example, Usagi calling forth the Super transformation when it should have been impossible without the Grail. Mamoru has shown us he can heal, he can feel the planet and locate anyone as long as they are on it naturally but aside from the roses, he doesn't really have earthly powers. The healing is described as warm and light. I imagine like a suns rays. Being able to be connected to the earth and locating people that way may seem earthly but it's not and it's a power called dowsing which can be done using items or not and had more to do with magnetic feilds which on the earth have a lot to do with none other than the sun. Feeling the state of the planet may seem like an earthly given power to but it's not and this is seen by everyone and not just Mamoru having this ability. The sun and moon, watching and protecting the Earth, creating the perfect guardian as a result of their love combining. It's a romantic theory I am just in love with but thankfully tons of theories can work for something as open and vague like this was. A side note. All the Senshis planets are dead or in a state of destroyed sleep or something. It did not effect the Senshi like it does to Mamoru. It seems NO Sailor Senshi has this problem BUT him. Why is that? Why are there two peoples health directly tied to the planet when no other planet we know if needs to do that? Perhaps because since it currently lacks a Guardian Senshi, it needs both of them to have a better chance of surviving until it does? I don't know but this is fun! Yup! This is part of the section's Greatest Hits reposting that's going on right now, just to give the section a little activity and to get new perspectives on old & buried posts! I would appreciate it if you would repost any responses here since the old thread is now locked and because I want to keep the discussion going! I did link to the old post in my first post up top but I can see how it's not very visible so I'm going to make an effort to change that based on the feedback (so thanks for it!). Anywho, back to the conversation! Well, Naoko Takeuchi herself stated in so many words that Tuxedo Mask is the "senshi" of Earth, and this was her exact reason for not making a Sailor Earth. Neo Queen Serenity cannot transform into Sailor Moon; ergo, Sailor Chibi Moon is the "Sailor Moon" of Crystal Tokyo. I remember something about sunspots causing the reawakening of Queen Metallia, or something like that. It seemed to protray the sun as a form of enemy, but I don't know if that's really how that was intended. Anyway, I think it's more of a sense of how the sun provides life and light to the Earth, I don't believe that statement in that panel was intended to hint that he was the guardian of the sun. Especially given the fact that he is intended as the Earth senshi.